another weekend, another project (or two)! and not just the pattern, but the pattern pieces pinned to fabric and cut out. which is to say, the most boring part was done already! with that out of the way, it would be quick to finish. now, ever since he saw the movie on father's day last year, little h has been crazy for coraline. every time he finds a button, he wants to stick it in his eye. 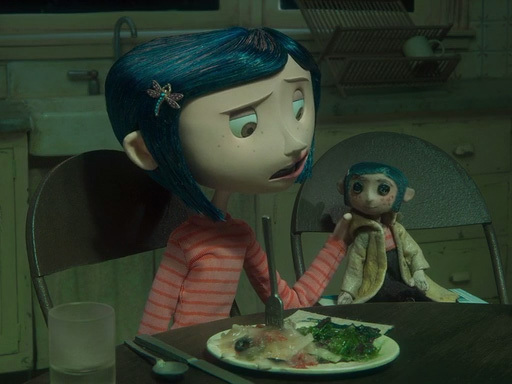 so i decided to make the doll into coraline's doll for him. the first thing to do was adjust the shape of the head - coraline's head is flat on top with a slightly pointy chin, so i sketched the new shape on the face piece with some tailor's chalk, and cut it to shape. i also tapered her arms and legs a bit to make them skinnier. i confess that when i put her together i was a bit concerned with how funny her head looked! but hoped that the addition of hair would make it all right. in the spirit of not-buying-stuff and just using what's already taking up space around the house, i dug up some peacock blue briggs & little. i bought it last fall to be one of the contrast colours in a curling sweater for little h (which i haven't started yet). i found a piece of cardboard about 8" x 10", cut notches in the corners (to keep the yarn from sliding off the ends) and started wrapping. when the cardboard was covered in yarn, i sewed along the very edge with my ol' elna supermatic. for most of her hair - to cover the back of her head - i wrapped lots of yarn and sewed along both edges of the cardboard, and then cut the whole lot right in half in between the rows of stitching (for two chunks of hair all the same length); for the "front" hair i wrapped less yarn and sewed along only one edge - since she wears her hair parted on the side, it would need to be long on one side and short on the other, so i only cut the yarn on one side. i reinforced the stitching by opening up the hair, and re-sewing along the stitching line a few times. i started attaching the hair by taking one of the "back" chunks and hand sewing it along the seam at the top of her head. then to prevent seeing a lot of bald "scalp" if she got flipped upside down, i glued the under-layer of hair down to her head with carpenters' glue (why carpenters' glue? because it was there!). then i stitched the second chunk and stitching it down on top. for the "front" hair, i laid it on top of her head and fiddled with it until it looked fairly even and her part was in the right place. then i stitched the part firmly to her head, and glued some pieces down along her forehead. i stitched the long bits down where her dragonfly barrette would go. at that point, h couldn't contain himself any longer! so coraline took a break and we all played a game of bear dominoes. later i found a bug barrette and put it in her hair. the reason her t-shirt looks so grubby, is it's an old one that h outgrew! he's a bit of a messy eater. but he loves her to bits - he is currently dragging her around the house! the only sad part? i had intended to make her a proper outfit - jeans, yellow rain coat & boots. the jeans i made from an old pair of mine, but the plan was to use h's rain pants (which he has never worn) for coraline's rain gear - but once i altered the jacket pattern that came with the doll (to add a hood and make it a bit longer) i realised i had nowhere near enough material! will have to root around for another option. le sigh. in the good news department though, i came home from work on friday to a house that smelled wonderful - and a plateful of cookies! chocolate/butterscotch chip with almonds, yum. 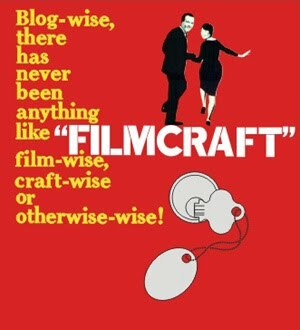 tg had been doing some research and found this brilliant page of tips. best husband ever! ok - kouign amann is a success! sort of. number one: use a bigger pan, and put a pan underneath to catch the overflow. i had bubbling butter-sugar all over the 425 oven, billowing black smoke out the front, windows open, smoke detectors wailing, concerned neighbours wondering what was going on. number two: watch it closely. i could have baked it at a slightly lower temperature in my oven - there's yummy burnt sugar, and there's acrid black goo. mine was a bit over the line in spots. number three: get it out of the pan as soon as possible. or at least loosen it. once it starts to cool, that lovely caramel becomes like cement. i did absolutely nothing yesterday (reeeally bad flare up after physio, it was as though someone was following me around jamming a hot iron between my shoulder blades) so i'm trying to catch up a bit today, even though i still can't turn my head or bend my spine at all! since i first heard about it a month or two ago, i have been dying to try making kouign amann, a traditional breton yeast-leavened butter cake. the dough is resting in the fridge as we speak. i seemed to use less flour than the recipe called for, possibly because i am using hard flour instead of all-purpose? seemed like a good idea at the time. we'll see how it goes. meanwhile, the bambeenster and i are about to sit down to a snack of sago. sago comes in little pearls - kind of like tapioca - that are made from the seeds of the sago palm. you don't see it a lot in canada, but my father (australian) was a big fan and i remember his excitement when he found it here. as usual, googling has resulted in recipes that don't look like exactly what i remember, so i freestyled a bit. i am curious now though to try some of the more traditional south-east asian sago desserts. combine first five ingredients in a small saucepan; cover and leave in the fridge for a few hours or overnight. simmer the soaked sago for 10 minutes over a medium flame. stir in butter and stir till melted through. pour into 2 ramekins and place in a bain-marie; bake at 350 for 30 min. sprinkle the tops with brown sugar and cinnamon and broil for 3 to 5 minutes, or until the sugar is melted and forming a crust. 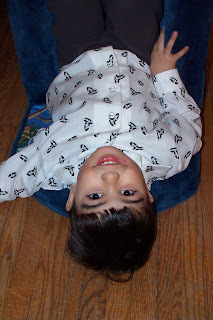 he prefers it upside down though. best ever: when i was taking it off pre-dinner (no point ruining it before anyone really sees him in it, right?) he said "no! i want to wear my beautiful shirt!" what a little sweetheart, he knows how to make me happy. i just lost my mum to brain cancer (hence the dearth of posts over the last few months). so i'm running 5k to raise money for the brain tumour foundation of canada. please sponsor me if you can! last august i ordered some wooden knitting needles from an online shop in england and they arrived super-quick and they were lovely! i was happy to order from them again for xmas, but that order was slow and they substituted an item (booo). now one of the lovely needles from the original order has snapped (booo) after being used hardly at all (the ribbing trim on a baby vest, and i had knit about 6 rows on a newborn size cardigan). i emailed 5 days ago asking them to send a replacement - that's not unreasonable, surely? at the very least they should reply to my emails. not cool. eta: got email today - they emailed me before apparently but i never got the message! yay, cruising towards a happy ending now i think! baby is late home from school (seriously, i'm beginning to wonder) but here is a look at the shirt! 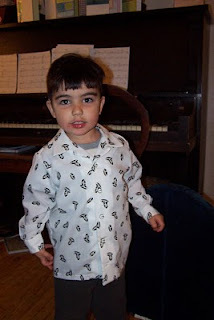 i made a really cool shirt for the bambino yesterday, out of fabric i got at the textile museum sale last summer - seems to be rayon, white with little vinyl records all over it - perfect for h's new incarnation as 1950s/rockabilly boy (along with the saddle shoes i bought him). but i finished it after he went to bed, so i haven't tried it on him yet, and don't even have a photo of just the shirt! oh well. works-in-progress! i just want stuff done. after finding some awesome saddle shoes for my wee guy, i am now determined to turn him into the ideal 1950s little boy. i'm making him a 50s-style shirt from a great vintage print i found at the textile museum sale - white with little black 45 rpm singles all over it. now here's the question: where can i buy little buttons - the right size & weight for a shirt - that are replicas of records? help! !